Singapore — At The Year in Infrastructure Conference, Bentley Systems’ CEO Greg Bentley introduced the OpenRail solution, comprising applications and services for the comprehensive planning, engineering, project delivery, and operations of rail and transit infrastructure. OpenRail’s foundation is Bentley’s connected data environment (CDE), shared by ProjectWise collaboration services and AssetWise operations services, and which for OpenRail now brings together digital components and digital context, through digital workflows. “Bentley Systems has a proven record in providing industry-leading solutions to improve project delivery and asset performance for the most challenging rail and transit projects around the world,” Bentley said. “Most of our applications portfolio is used on rail projects, and we’ve advanced BIM for rail, in particular, with our Rail Track offering, rail corridor maintenance optimization through Optram, and via ComplyPro for railway requirements progressive assurance. However, the conception of these specific tools for specific purposes preceded the aspiration for what we now call digital workflows, where engineering deliverables are meant to be reused throughout the asset life cycle. OpenRail is based on a connected data environment (CDE), comprising the shared services of ProjectWise and AssetWise, as configured specifically for rail systems engineering workflows. During project delivery, ProjectWise facilitates the collaboration among distributed engineering teams, coordination of structured workflows, and connected project visibility. For OpenRail, AssetWise provides asset life cycle information services for linear, network and geospatial referencing, corridor maintenance decision support, inspection workflows, and reliability and change management. OpenRail CDE services include Components Center for digital components, ContextShare for digital context, ComplyPro for progressive assurance, and ConstructSim Completions for accessing operational readiness. ComplyPro is the established market leader in rail globally for governance of collaborative assurance systems of technical and safety requirements from concept to project handover. OpenRail extends this scope to progressive operations assurance and regulatory compliance. ConstructSim Completions automates the inspections process to accelerate systems progress and validate system readiness for efficient project turnover and closeout. Components Center is an Azure cloud service of libraries which align, across disciplines and applications, the semantic content of catalogued components, potentially including vendor data, fabrication details, component requirements (for example, electrical specifications and connections), reliability characteristics, and representational views required for documentation (for example, 3D, plan, schematic). A digital component is reused across BIM workflows in design modeling, analytical modeling, construction modeling, and asset registries — from catalogued component, to engineered component, to installed component, to operated component. The OpenRail Components Center is being initialized with libraries of generic rail components with appropriate intelligence, and libraries from significant providers such as Siemens, but is intended to be maintained and extended by user organizations. Reality modeling incorporates digital context in the rail infrastructure workflow. Bentley’s ContextCapture processes digital photography and/or laser scans, from UAVs or hand-held or train-mounted devices, to produce an engineering-ready “reality mesh” accurately representing the continuously surveyed conditions of a railway corridor, site, or station. Throughout detailed design, the reality mesh, for example, can be used to consider sight lines for signal siting. Because the reality mesh can be captured continuously, construction progress can be tracked and compared to the expected progress of the detailed design. In operations, the reality mesh can be used to compare the as-operated 3D model with the as-designed model, and serve as an immersive 3D environment with hyperlinks to equipment sensors for operations visibility and emergency response training. 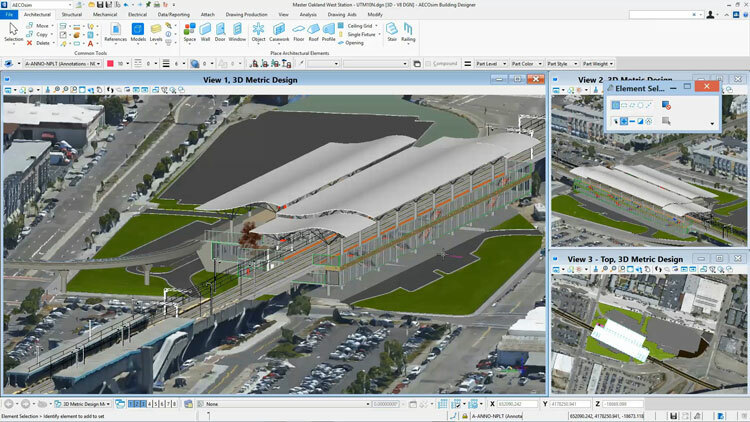 OpenRail ConceptStation, enabled by the combination of OpenRail’s digital components and digital context, uniquely extends BIM capabilities to rail conceptual planning and layout. Working in the 3D design environment of the geo-coordinated reality mesh as the digital context of the rail corridor, the user can access Components Center to drag and drop digital components into the design to quickly lay out rail lines, bridges, overhead lines, signals, tunnels, etc. With the context of the terrain, and the intelligence of the digital components, OpenRail ConceptStation can quickly calculate quantities of railway elements such as track, ballast, sleepers, contact and catenary wire, equipment, bridge decking, concrete, and steel, as well as the cut-and-fill earthwork required for the conceptual design, and interactively produce a preliminary cost estimate to evaluate feasibility. All the design information, components, and context in the conceptual design can be reused in a digital workflow to OpenRail Designer for detailed design of the railway infrastructure. In digital workflows, data captured or created for one purpose is accessed by computer programs for other purposes, saving time, minimizing rework, and improving data quality over the asset lifecycle. Digital workflows can also converge the work of different disciplines for additional advancements in project delivery and asset performance. Examples enabled by digital workflows include conceptioneering, constructioneering, inspectioneering, and operationeering. Each of these workflows represent new opportunities for engineers and their work to add value beyond their traditional role in design, to include contributions to construction, inspections, and operations. Learn more about OpenRail at https://www.bentley.com/products/brands/openrail.